The 7 x 5 Apex Double Door Pressure Treated Overlap Shed is a very well made and in many ways one of the more high end discount sheds you can get. 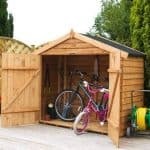 The overall size of the shed is just perfect for those who want somewhere to keep tools, gardening equipment or even just the kids bikes and summer toys. 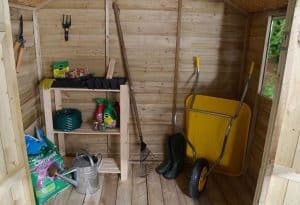 You do not have to worry about this shed taking up all the space in your garden, so even smaller gardens will be able to enjoy this. A great set of large double doors has been used to make it easier to get in and out. When you are inside the shed, you have plenty of headroom as the shed has elevated eaves which will make moving around much more comfortable. 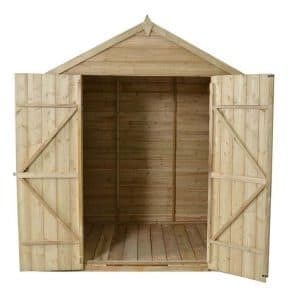 This is a very well made shed, especially considering the price. It is constructed from long lasting, pressure treated wood. The overlap cladding and the solid frame make for a great combination that will ensure this shed lasts for many years. The floor has been made using 12 mm thick boarding so even if you have very heavy tools or a large mower, the floor is going to be strong enough to handle it. 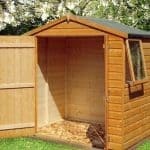 With its pressure treated wood, the 7 x 5 Apex Double Door Pressure Treated Overlap Shed is one of the better made discount sheds that we have come across. 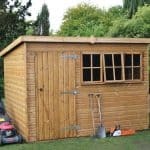 No doubt this is one fantastic looking shed and the storage space that it is offering you is actually more impressive than the 7 x 5 in its name suggests. While you will have to carefully plan where you put things, the 6 feet 9 inches of width and the 4 feet 9 inches of depth can go pretty far as long as you do not just open the doors and dump things on the floor. One of the most impressive aspects of this shed is the height. Along the ridge there is 7 feet 3 inches of headroom, but it is the eaves that caught our attention as they are 6 inches higher than you would normally get in a shed of this size, so you could use some shelving to keep things off the floor. Made with 8 mm thick solid sheet boarding, the roof is far better made than the first glance you give it suggests. While 8 mm thick solid sheet boarding is the most basic kind of roof you can get in a shed, they have given it a strong backbone thanks to the thick roof battens they have used. We could have many, many inches of snow and this smart looking apex roof will happily take the weight of it all. The 7 x 5 Apex Double Door Pressure Treated Overlap Shed has 8 mm thick overlap cladding which is the style of cladding that many discount sheds seem to go for. But the cladding they have used on this one has a more smooth look than any of the others we have seen. Overlap cladding can sometimes have a rustic kind of look to it, but that is not the case here as this shed has a very modern look. Supporting the cladding is a 28 mm x 28 mm frame. This is the perfect kind of frame for a shed of this size. It will keep the structure strong and solid, but it is not too bulky so you do not have to worry about it interfering with your storage space. The cladding is attached to the frame very securely, which you can see from the pictures, so this shed will stand strong for many years. Rather than just use the same boarding for the floor that they have for the roof, some very smart looking and solid 12 mm thick boards have been used. These boards will allow you to put some really heavy items in the shed. Also they will not have that bouncy kind of feel that solid sheet boarding can sometimes have. As an added bonus these floor boards look great and certainly go with the flow of the overall design very well. This is one of the few discount sheds that we have seen which is pressure treated. The fact that the 7 x 5 Apex Double Door Pressure Treated Overlap Shed is pressure treated means that you do not have to worry about coating it with wood treatment after installation. As a matter of fact this shed is good to go for well over a decade without you having to lift a paintbrush. They are so proud of the wood treatment process that they are confident enough to give a very generous 15 year anti rot warranty with this shed. Best of all, you are not required to do anything to make this warranty valid. We really like the double doors that they have used here. When both doors are open there is 3 feet 8 inches of width and 5 feet 8 inches of height. With the doors being right slap bang in the middle of the front of the shed, their large size means that when they are open you will have quick and easy access to your belongings inside. The doors are also very strong as they are supported with hidden hinges that will prevent sagging. Also instead of regular framing, double z framing has been used to make sure that these doors are extra strong. We have seen more than a few discount sheds that do not have any windows at all, so it was a nice surprise to see that the 7 x 5 Apex Double Door Pressure Treated Overlap Shed does have a window. There is one shatterproof polycarbonate window located on the side of the shed. To be honest with you one window is all you need on a shed of this size. The doors are strong and have hidden hinges, but there is also a hasp and staple included. Now there is no padlock so if you do want to keep the doors locked at night, you will need to buy one. But you can get a padlock for under a pound these days so it is not a problem at all. We are more than happy with the level of privacy that the 7 x 5 Apex Double Door Pressure Treated Overlap Shed offers. The one window that there is, is located on the side so if you do have nosey neighbours just position the shed so it is facing away from them. If privacy is still a concern then just add a cheap bit of fabric or if you want to be a bit more classy, a curtain. As the wood is pressure treated there are not any customisation options available for you. Still that does not mean you cannot paint the shed if you do want to brighten it up a little bit. Rather than use regular old paint though, we would suggest using a coloured wood treatment. Yes, wood treatment is not needed, but if you are going to colour the shed, you might as well give it that extra bit of protection against the elements. 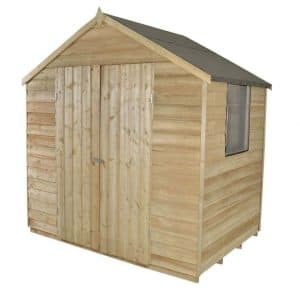 When it comes to extras discount sheds tend to be a hit or a miss, but there are a few extras on offer with the 7 x 5 Apex Double Door Pressure Treated Overlap Shed. 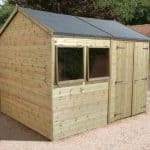 They do offer an installation service for a cost of £149.99, and while this is cheaper than we have seen elsewhere offer it, we do feel that it still adds far too much money onto the overall cost of the shed. For the reasonable price of £16.24 you can add a Shed Solar Light which is great if you are sick of walking into tools in the dark. One other interesting extra they have is a Pro Shed Base Kit. This costs a pretty reasonable £84.99, and is for those of you who are not too happy about the surface you are going to be installing the shed on. We are very impressed with the overall quality of this shed. It is very hard to point to any one area and say that they could have done that better. That pressure treated wood is going to last for many, many years. 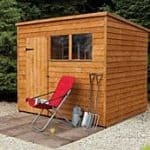 Which along with the cladding and frame make this a shed that could potentially give you a lifetime of use. The elevated eaves do make stacking things up easier, but there is still a decent amount of floor space, especially considering this is a more compact sized shed. We do not see you having any trouble with this at all. It should be a pretty stress free installation. Just be sure to have a friend to help as this is certainly a job for two people. Being just over £250 is incredible. 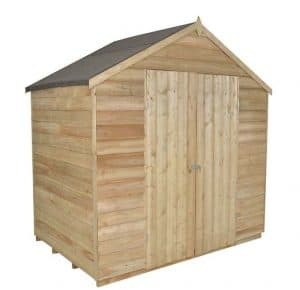 But when you consider all the bells and whistles this shed has like the extra support for the roof, pressure treated wood, raised eaves and so on, you really start to appreciate what a fantastic deal this is. Final Thoughts: The 7 x 5 Apex Double Door Pressure Treated Overlap Shed is one of the better discount sheds that we have seen. 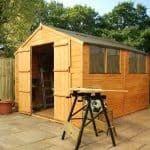 We are very impressed with this shed and feel that they really have gone above and beyond to make a great product here. For the asking price, we cannot believe they were able to make this with pressure treated wood, have a 12 mm thick floor and give the roof that extra support. 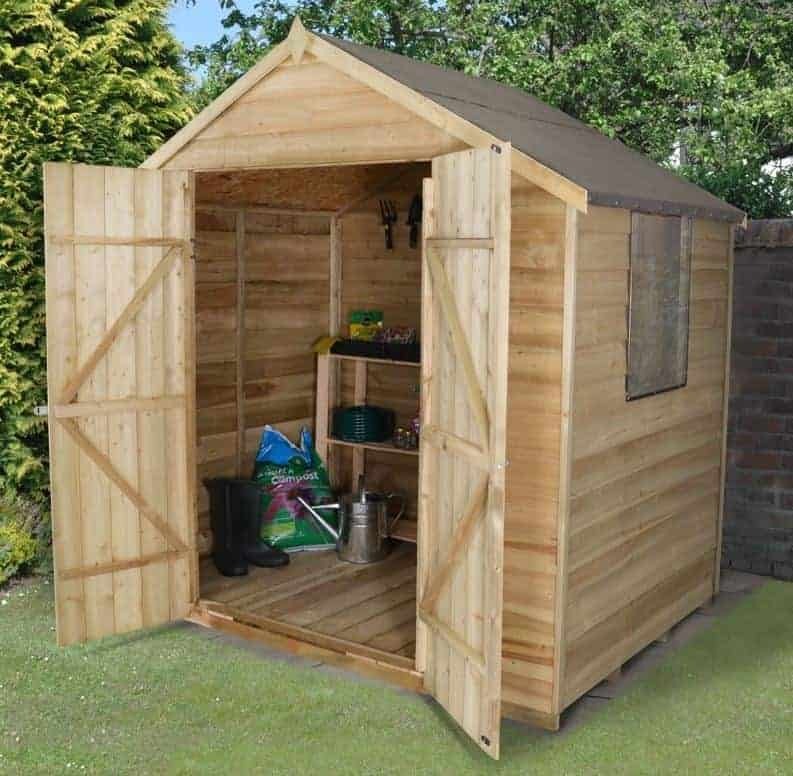 The size may be an issue for some, but for those just looking for that little bit of general storage, this shed is perfect! It will just stand there for years doing its job well and it will not require much if any attention from you. Plus the fact that it is easy on the eyes is a very nice bonus.